The Tesla beginner's guide: why are they the cars of the future? If you've spent much time on T3.com over the last year or so you can't fail to have seen plenty of stories about Tesla Motors - the future-focused car company run by tech entrepreneur Elon Musk, known for a few other small operations such as SpaceX. Such has been Tesla's rapid rise, though, you can be forgiven for not knowing exactly where the company has come from, where it's going, and what it actually makes - and we're here to fill in all the blanks with our complete beginners guide to Tesla and its cars. Tesla Motors came into existence in 2003 but it wasn't until 2008 that it properly captured the public's attention with the first electric sports car - the Tesla Roadster. In 2016, electric cars are pretty familiar to us, even if they're still not widely used. In 2008 though, an electric vehicle - and a sports car at that - was definitely enough to raise a lot of eyebrows. It was the first highway-legal, full-production electric car to be able to travel more than 200 miles between charges and the first to use lithium-ion battery cells (the same kind of technology that powers your smartphone). The now-discontinued Tesla Roadster used an AC motor based on Nikola Tesla's original design from 1882, hence the company name. As for Elon Musk, he's been the company's chief financier and cheerleader. Tesla didn't invent the idea of the electric car but it's been one of the key players in pushing development and innovation, almost to the point of bankruptcy. Getting electric cars manufactured at scale is no easy task, and the company has relied on angel investors (including Musk) plus investments from Daimler and Toyota to keep going. Electric car technology and high-performance batteries have always been at the centre of Tesla's operations - indeed it now sells batteries for the home too, which can soak up the power produced by solar panels and keep your house running for a day all on its own. It's been a long and bumpy road but Musk and his partners have always had a long-term vision of where the tech was headed, as you can read about in his 2006 blog post. "The overarching purpose of Tesla Motors... is to help expedite the move from a mine-and-burn hydrocarbon economy towards a solar electric economy, which I believe to be the primary, but not exclusive, sustainable solution," writes Musk. Tesla purposely started with a premium sports car to fund development of the technology and the high entry costs, and hopes to plough all its profits back into research and development to make its cars more affordable over time (today the cheapest Tesla you can order will set you back $35,000 or roughly £28,000). In short, Tesla's more than a car company wanting to bring electric motors to the masses - it's also trying to reduce our reliance on fossil fuels and promote renewable energy sources such as solar power. Besides driving the adoption of rechargeable electric power, Tesla is also pushing hard in the field of self-driving motors. Tesla's current models come with a self-driving mode called AutoPilot, which can take over at the wheel on motorways. It's like an advanced cruise control, monitoring your speed and keeping you in the right lane. Motorways are relatively easy for self-driving cars as they're just long, well-marked, predictable strips of road, but AutoPilot actually contains everything you need for a fully autonomous driving experience - it just isn't fully enabled yet (not least because self-driving cars have yet to be made legal). The idea is that Teslas will collect data as they travel, improving the integrated self-driving mode even when it isn't switched on. Elon Musk reckons you'll be able to summon your car from the other side of the country by 2018 and Tesla has the demo videos to prove it. If the electric motor doesn't tempt you into a purchase, then maybe the autonomous driving technology will. That's a whistlestop tour of the Tesla Motors technology and the vision behind it - so what are the cars it actually sells? We've mentioned the Roadster, which is discontinued for the time being but is expected to eventually return in a new form, and then there are three other models to know about. The futuristic-looking Model X is the most expensive (starting at £79,500 or $88,800) and comes complete with gull-wing doors. It can travel 289 miles between charges, sit seven people, and go from zero to 60 mph in just 2.9 seconds. The Model S is slightly older and slightly cheaper (prices start at £57,000 or $68,000). It can travel an amazing 409 miles between charges (although that's in perfectly optimised conditions) and goes from 0-60 in a mere 2.5 seconds. The newest Model 3 is the cheapest of the lot but is still at the pre-order stage - you can put your name down for one with a deposit, and the expected retail price is listed as $35,000 (roughly £28,000 at the time of writing, with UK pricing to be finalised in 2017). With 215 miles between charges and a 0-60 speed of under six seconds, the Model 3 doesn't have the high performance of the other two cars, but it's the first Tesla to be within the reach of the average punter (just about). 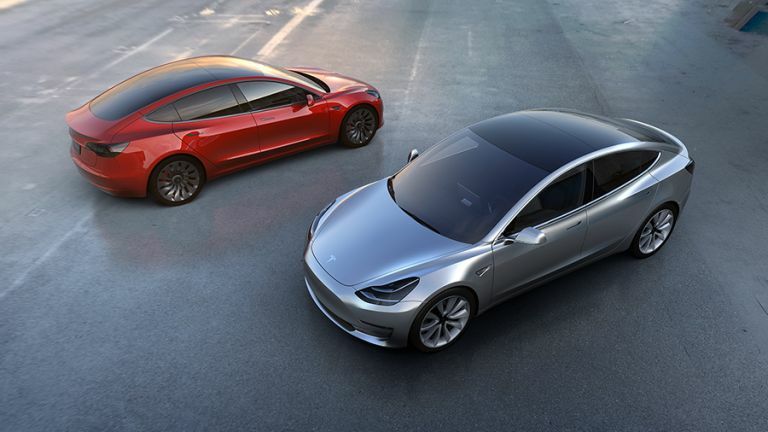 The company says it's received close to 400,000 Model 3 pre-orders to date and it's expected to arrive in 2017. When will you be able to get behind the wheel of a self-driving car?